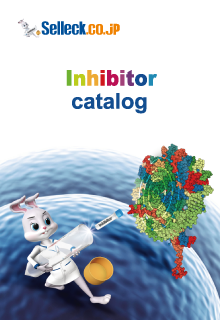 Bcr-Abl kinase assays are performed in 25 μL of reaction mixture containing 250 μM peptide substrate, 740 Bq/μL [γ-33P]ATP, and 20 μM cold adenosine triphosphate (ATP) by using the SignaTECT protein tyrosine kinase assay system. 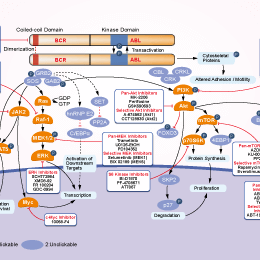 Each Bcr-Abl kinase is used at a concentration of 10 nM. Kinase assays for Abl, Src, and Lyn are carried out with an enzyme-linked immunosorbent assay (ELISA) kit. The inhibitory effects of NS-187 against 79 tyrosine kinases are tested with KinaseProfiler. 実験の流れ： K562, BaF3/wt, BaF3/E255K, and BaF3/T315I cells are plated at 1 × 103 in 96-well plates, whereas KU812 and U937 cells are plated at 5 × 103 in 96-well plates. Cells are incubated with serial dilutions of Bafetinib for 3 days. Cell proliferation is measured by MTT (3-(4,5-dimethylthiazol-2-yl)-2,5-diphenyltetrazolium bromide; Nacalai Tesque) assay, and the 50% inhibitory concentration (IC50) values are calculated by fitting the data to a logistic curve. 動物モデル： KU812 xenograft is established by subcutaneous injection of KU812 cells into the right flank of Balb/c-nu/nu female mice. 製剤： Bafetinib is dissolved in 0.5% methylcellulose.